Bryan regularly teases me about my obsession with candles -- Poor guy has come home on more than one occasion to a house that resembles midnight mass on Christmas Eve... But really is there anything prettier than candlelight? I am awfully picky about candleholders though. I usually go for ultra minimal clear class cylinders, but after spotting these sweet votive holders from Cursive Design, I'm tempted to branch out a bit. I feel so lucky to have married someone who converted to a love of candlelight so quickly! Plus, he remembers to extinguish them all - not my strong point. 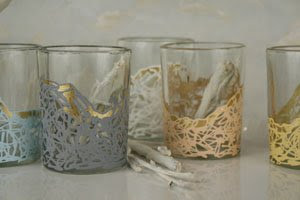 Love these votives - I need to branch out from IKEA! gorgeous! everyone and everything looks better in candlelight, don't you think? one of our friends here feels that way so strongly that her dinner parties are like one of those dining experiences in the dark. where you need night vision goggles. like, what am i eating now? but, boy...do i look cute at her house. I've seen these...they're so pretty! I bet they're even more lovely with a candle lit inside! Oh I love these. I have a juice glass obsession...maybe these could work for my collection?! absolutely loving these right now! such pretty subtle shades, and i bet they cast gorgeous candlelight shadows. everything just seems more peaceful and beautiful drowned in candlelight, don't you think? I think you'd like these holders. I don't know if it is possible for glass to be cuddly but I think these come close.